Preferred oriented ZnFe2O4 nanowire arrays with an average diameter of 16 nm were fabricated by post-annealing of ZnFe2 nanowires within anodic aluminum oxide templates in atmosphere. Selected area electron diffraction and X-ray diffraction exhibit that the nanowires are in cubic spinel-type structure with a  preferred crystallite orientation. Magnetic measurement indicates that the as-prepared ZnFe2O4 nanowire arrays reveal uniaxial magnetic anisotropy, and the easy magnetization direction is parallel to the axis of nanowire. The optical properties show the ZnFe2O4 nanowire arrays give out 370–520 nm blue-violet light, and their UV absorption edge is around 700 nm. The estimated values of direct and indirect band gaps for the nanowires are 2.23 and 1.73 eV, respectively. As an important member of ferrite family, nanometer-sized spinel ZnFe2O4 has received growing interest from the fundamental and experimental point of view because of its potential application in gas sensors with high sensitivity and low-energy consumption [1–4]. Besides, the nanometer-sized ZnFe2O4 is considered as a promising semiconductor photocatalyst for various photochemical processes, such as photoelectric conversion and photochemical hydrogen production from water, owing to its ability to absorb visible light, high efficiency, low cost, and excellently photochemical stability [5–7]. Meanwhile, the nanometer-sized ZnFe2O4 shows unusual magnetic properties compared to the bulk form , such as high Curie temperature and large magnetization at room temperature (RT) have been observed in ZnFe2O4 nanoparticles and films [9–12]. The issue has been extensively researched and ascribed to the dominant role of oxygen vacancies , surface effects , as well as cation random distribution of magnetic Fe3+ ions and diamagnetic Zn2+ ions among the interstitial octahedral (B) and tetrahedral (A) sites . One-dimensional nanostructures can provide versatile building blocks for fabricating functional nanoscale electronic, optoelectronic, biomedical devices, magnetic and optical properties based on the bottom-up paradigm [16–20]. Recently, arrays of Ru, Pt, and PtRu nanowires and nanotubes were prepared by electrodeposition through the porous structure of an anodic aluminum oxide (AAO) membrane . Iron-based 1D nanostructures have been successfully prepared using an electrospinning technique and varying the pyrolysis atmospheres . Besides,1D magnetic MFe2O4 (M = Co, Ni and Mn) nanomaterials also have been fabricated owing to their unique application in mesoscopic physics and nanoscale devices excellent properties [23–25]. For zinc ferrite, Liu et al. fabricated ZnFe2O4 nanowires exhibiting unusual magnetic behavior by the thermal decomposition of the precursors inside silica host SBA-15 template . By using a facile sol–gel AAO template method, Zhang and Liu et al. got highly ordered ZnFe2O4 nanotube arrays, which displayed low-energy consumption and high sensitivity to organics as gas sensor materials and exhibited unusual photovoltaic behavior [7, 27]. However, all these 1D ZnFe2O4 nanostructures have no orientation, where Kim et al. demonstrated that ordered ZnO microrod arrays with the preferred orientation of  direction showing a strong free-exciton emission at 3.23 eV and a weak deep level emission at 2.2 eV reveals the high optical quality than that of the ZnO nanowire arrays with no orientation [28, 29]. Recently, Zhang and Zhu et al. demonstrated that the properties of 1D nanostructures depend strongly not only on the ordered arrangement but also on the crystal orientation as well [30, 31]. In our previous, the ordered CoFe2O4 nanowire arrays with preferred crystal orientation were prepared by using the template synthesis in conjunction with electrochemical deposition . Here, ordered ZnFe2O4 nanowire arrays with preferred crystal orientation of  direction were prepared by spatial confinement oxidation of preferred  crystal orientation ZnFe2 alloy nanowires in AAO templates. The magnetic and optical properties of ZnFe2O4 nanowire arrays were studied. AAO was used as the template to synthesize ZnFe2O4 nanowire arrays. The AAO templates were prepared through two anodizing steps as our report previously . Briefly, high purity (99.999%) aluminum foil was polished in the mixed solution of ethanol and choric acid (HClO4) in the constant current of 1.5 A for 5 min. The two-step anodization process was carried out in constant voltage mode to improve the arrangement of the ordered nanopore arrays. In the first step of the anodization, aluminum foil was anodized in 0.3 M H2SO4 aqueous solution under the constant voltage of 13 V at 0°C for 0.5 h resulting in the textured surface, and then the formed anodic alumina layer was removed in the mixed solution of 0.4 M phosphoric acid and 0.2 M chromic acid at 60°C. Subsequently, the foil was re-anodized for 4 h using the same parameters in the first step. The electrolyte contained FeSO4·7H2O (22 g/l), ZnSO4·7H2O (10 g/l), H3BO3 (10 g/l) with the pH value of 3.2. The alternating current electrodeposition was conducted at 200 Hz and 13 V for the duration of 5 min. The compositions in the ZnFe alloy nanowires were analyzed by energy dispersive X-ray spectroscopy (EDS) and inductively coupled plasma-atomic emission spectrometer (IRIS, ER/S). The results indicate the atom ratio of Fe:Zn is about 2. Because of the confinement of the nanopore size, after heat treating the well orientation ZnFe2 alloy nanowire arrays in tube furnace at 460°C for 21 h in atmosphere, the arrays of ZnFe2O4 nanowires inside the AAO templates with preferred crystallite orientation were obtained. 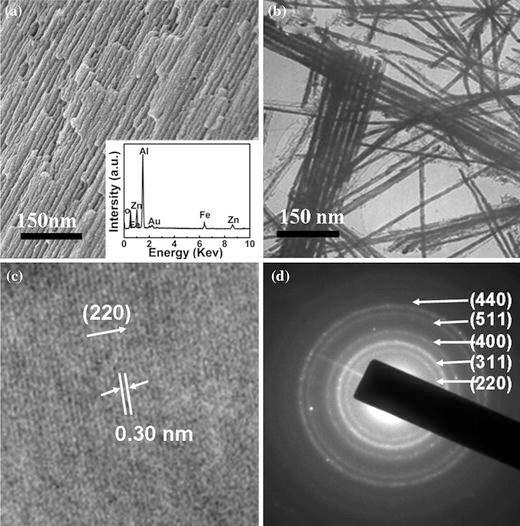 The morphologies of the nanowires were obtained by using the scanning electron microscope (SEM, Hitachi S-4800) and transmission electron microscopy (TEM, JEM-2010), where the nanowires were separated from the AAO templates by dissolving the aluminium oxide templates in the mixed solution of 0.2 M H2CrO4 and 0.4 M H3PO4. The selected area electron diffraction (SAED) and X-ray diffraction (XRD, X’ Pert PRO PHILIPS with Cu Kα radiation) were employed to study the structure of the nanowires. The measurements of magnetic properties were made using Quantum Design MPMS magnetometer based on superconducting quantum interference device (SQUID) and vibrating sample magnetometer (VSM, Lakeshore 7304). Micro photoluminescence (PL) measurement was carried out at room temperature (RT) using a He-Cd laser with the wavelength of 325 nm and output power of 15 W as the excitation source. 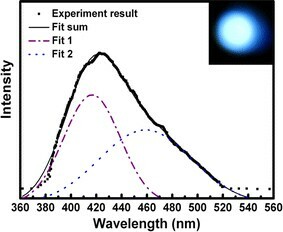 Light absorption property was measured using a UV–vis spectrophotometer (JASCO, UV-550). Figure 1a shows the cross-sectional SEM image of ZnFe2O4 nanowires within AAO template. It is found that the nanowire arrays are ordered in AAO templates, and the average diameter is about 16 nm with the aspect ratio of 125. The EDS spectrum of the sample is shown in the inset of Fig. 1a, which reveals that the atom ratio of Zn: Fe is 32.3:67.7 (about 1:2), the same as the result of ICP. Shown in Fig. 1b is the TEM image of ZnFe2O4 nanowires, which has a diameter consistent with the result of SEM. Figure 1c shows the high resolution TEM image of the corresponding ZnFe2O4 nanowires. The lattice fringe between the two adjacent planes is about 0.30 nm apart, which is equal to the lattice fringes of the standard ZnFe2O4, growing along the  direction. The SAED pattern taken from the nanowires is shown in Fig. 1d, consisting of five obvious rings, which are corresponding to (220), (311), (400), (511), and (440) planes of polycrystalline ZnFe2O4 with a cubic spinel-type lattice structure . XRD patterns of the ZnFe2 and ZnFe2O4 nanowire arrays within AAO templates are shown in Fig. 2a, 2b, respectively. Besides the smooth amorphous broad peak which comes from the AAO template, there is a sharp peak in XRD pattern of ZnFe2 nanowire arrays implying that orientation of  is perfect preferred. Similarly, the diffraction peaks of ZnFe2O4 nanowire arrays shown in Fig. 2b can be indexed as (220), (311), and (440) of spinel-type lattice structure, and the  texture is along the axis of the ZnFe2O4 nanowire arrays. XRD pattern of the ZnFe2O4 powders is shown in the inset of Fig. 1b for comparison. The schematic of the possible formation process of preferred oriented ZnFe2O4 nanowire arrays is shown in Fig. 2c. The process could be described as: ZnFe2 + 2O2 → ZnFe2O4. The XRD result shows that the ZnFe2 alloy nanowires have the preferred  crystal orientation along the axis of nanowires, which combined with the minor holes of AAO templates playing an important role to make the growth of ZnFe2O4 nanowire arrays largely guide along the nanowire axis direction when heat treated. To sum up, there are two main conditions that make the nanowire arrays prefer crystal orientation: the one is the well orientation of original metal crystal, and the other is the spatial confinement of the minor hole. The magnetic hysteresis loops recorded at 300 and 80 K using SQUID for ZnFe2O4 nanowire arrays within AAO templates are shown in Fig. 3, where // and ⊥ represent that the applied field H is parallel and perpendicular to the major nanowire axis, respectively. The slope of the linier contribution in the saturation region has been subtracted. It can be seen that the magnetic hysteresis loops in parallel and perpendicular directions at both 300 and 80 K are separating, indicating the existence of magnetic anisotropy for preferred oriented ZnFe2O4 nanowire arrays, and magnetic easy axis is directed along the wire axis. Nearly, zero coercive forces are observed at 300 K both in the parallel and in the perpendicular direction (H c// = 5 Oe and H c⊥ = 3 Oe). The magnetic hysteresis loops measured at 80 K indicate the coercivity (H c ) and squareness ratio (M/M s ) are about 290 Oe (H c// ), 125 Oe (H c⊥ ), 0.21 (M/M s// ), and 0.08 (M/M s⊥ ), respectively, where the magnified view of the magnetic hysteresis loops is shown in right bottom insets in Fig. 3a and 3b, respectively. The magnetic hysteresis loops of ZnFe2 nanowire arrays within AAO templates recorded at RT by VSM are shown in left top inset of Fig. 3a for compared. As we known, bulk Zn-ferrite belongs to the normal spinel structure with paramagnetic properties at RT and long range antiferromagnetic order below 10 K . However, nanocrystalline zinc ferrite is of great interest due to its unique magnetic properties that differ substantially from its bulk counterpart . 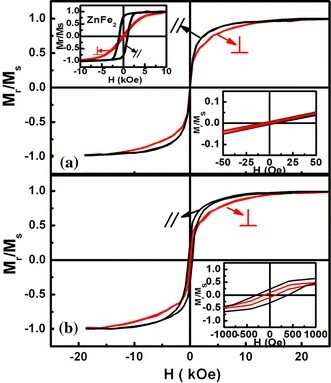 The occupancy of Fe3+ ions on both A- and B-sites leads to strong negative superexchange interaction between Fe3+ ions with large magnetization values. In our experiment, when ZnFe2 alloy nanowires were post-oxidation annealed, defects and the disorder of cation redistribution on A- and B- sites may occur, which can induce the magnetization for ZnFe2O4 nanowire arrays in our case. For the spinel ferrite, the easy axis of magnetization is , and the hard one is . The axis  is between them having the angle (θ) of 45° with the  and  directions, respectively. The total anisotropy is determined by the magnetostatic energy and the magnetocrystalline anisotropy energy. As the nanowires are oriented in polycrystals with high aspect ratio of 125, the easy magnetization direction determined by magnetostatic energy is along the axis of the nanowires. It can be seen from Fig. 4, the anger of α is not fixed but changed from 0° to 360° in xy plane. So we presumed that the distribution of  may be like a conical axis shown in Fig. 4. When the applied field H is parallel to the nanowire axis ( direction), the magnetic moment components in xy plane cancel out each other, while the magnetic moment components in  direction are summed up. Owing to the high aspect ratio of the nanowires, it is concluded from earlier analyses that the easy magnetization axis of the nanowires is along the axis direction. where A is a constant that depends on the transition probability, is the energy of incident photon, and q is an index that characterizes the optical absorption process . It is well known that direct and indirect band gap energy for the semiconductor nanostructures can be obtained from the intersection of linear fits of versus plots for q = 1/2 and 2 on the x-axis. Here, the estimated values of the direct and indirect band gaps are about 2.23 and 1.73 eV for preferred oriented ZnFe2O4 nanowire arrays, respectively (shown in Fig. 6b and 6c). Improved optical properties of the ZnFe2O4 nanomaterials are expected, and these aspects need further investigation. 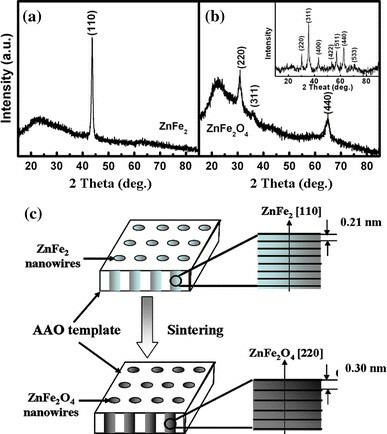 In summary, arrays of ZnFe2O4 nanowires with diameters of about 16 nm were successfully fabricated by electrodeposition of Zn2+ and Fe2+ into AAO templates and post-oxidation annealing in atmosphere. The results of XRD and HRTEM exhibit that the nanowires have the bcc structure with  as the texture direction along the nanowire axis. 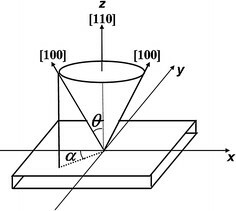 The preferred orientation and shape anisotropy of the nanowire arrays makes the ZnFe2O4 nanowire arrays to exhibit the uniaxial magnetic anisotropy with the easy magnetization direction along the nanowire axes. 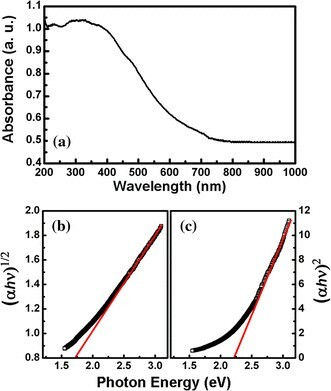 The optical properties show ZnFe2O4 nanowire arrays give out blue-violet light, and the optical band gap E g is estimated from absorption coefficient. Further investigation into magnetic and optical properties of the ZnFe2O4 nanomaterials is in progress. This work is supported by National Science Fund for Distinguished Young Scholars (Grant No. 50925103), The Keygrant Project of Chinese Ministry of Education (Grant No. 309027) and The Fundamental Research Funds for the Central Universities (Grant No. Lzujbky-2009-162).